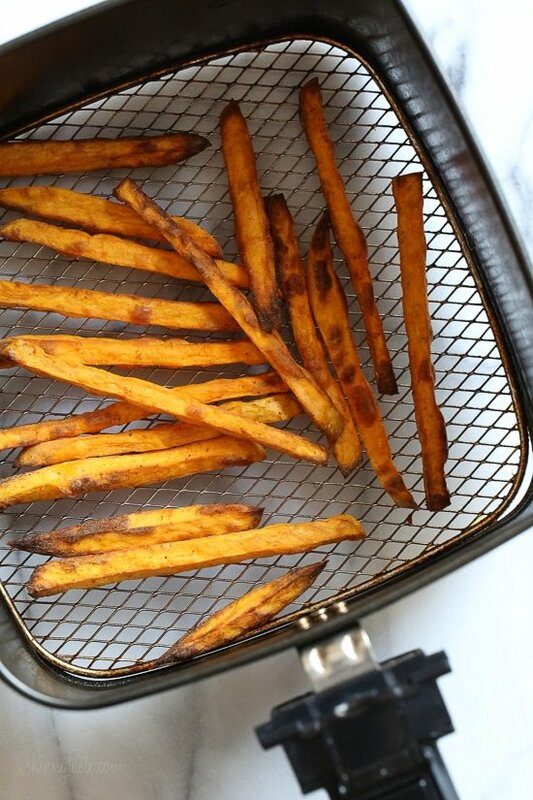 How to Make Sweet Potato Fries in an Air Fryer! 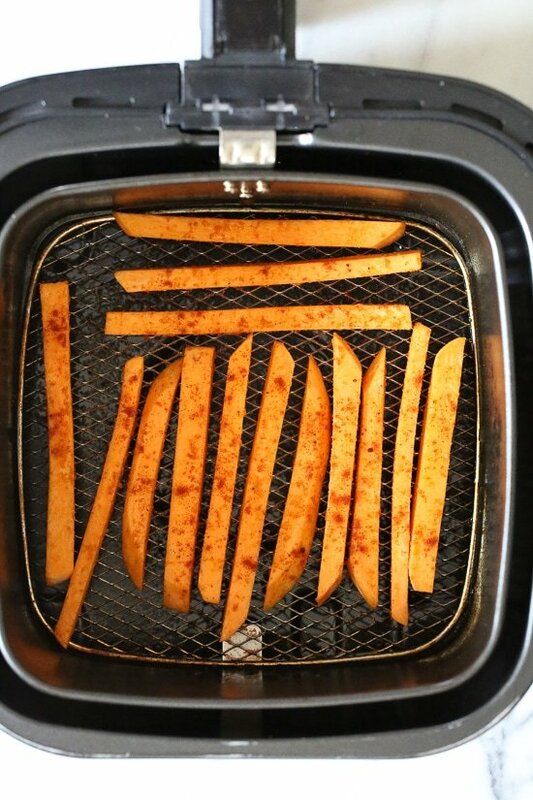 Crispy sweet potato fries made in the air-fryer, with just a small amount of oil! 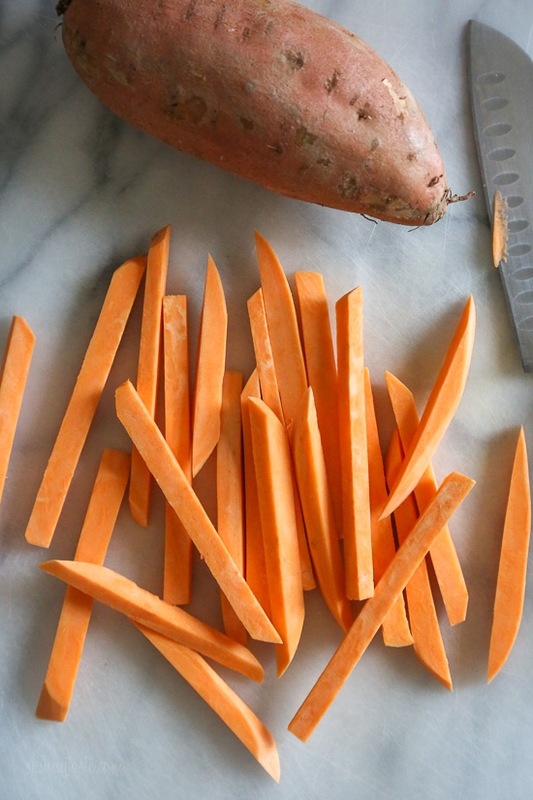 An easy sweet potato recipe you’re going to love! 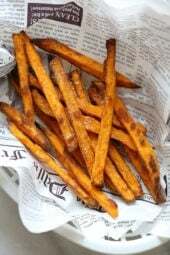 Making sweet potato fries in the air fryer is so much healthier than frying, and reduces the fat and calories, without sacrificing taste. Since buying my air-fryer (affiliate link), I’ve been keeping it on my counter and using it everyday. 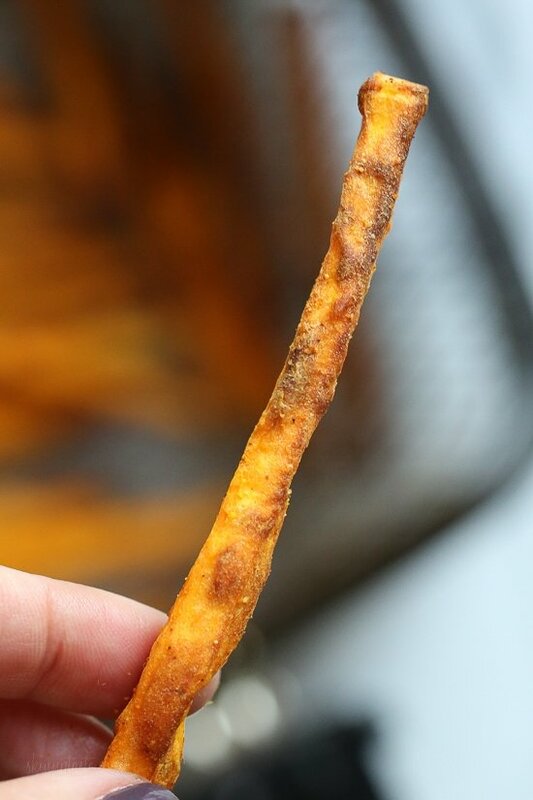 You may have seen my air fryer french frie recipe a few weeks ago, well so many of you have asked for sweet potato fries so I finally got around to it. I tested them out a few different temperatures to see which gave me perfect, crispy fries and here’s what I found. You can also bake them in the oven, see my oven baked sweet potatoes recipe. Start by making sure you cut them all the same size. This way, everything cooks at the same time, without burning, overcooking or under-cooking some. Don’t overcrowd the basket. One small sweet potato will fit perfect but if it’s slightly larger, do them in batches. To make sure they are all hot at the same time, you can add the batches that are cooked back in the air fryer and heat them up 1 minute so everything is hot. Don’t forget to turn them halfway. This is a must, the heat on the bottom is stronger than the top so turning is a must. Open to test for doneness. Don’t be afraid to open the air fryer to check to see if they are done. If your fries are cut a little thicker, they will take longer to cook. Bake at 400F. I found this gave me the crispest fry. An air fryer is a kitchen appliance that cooks by circulating hot air around food at high speed, which produces crispy food in a fraction of the time it would take in a conventional oven. Is using an air fryer healthy? Yes, it’s healthier that deep frying because you use less oil. An air fryer is an excellent way to reduce a massive amount of fat and calories without sacrificing taste. Since air fryers use air to cook food, it doesn’t require the extra calories that submerging food in oil would add. A few more dishes I’ve made with the air fryer that I loved: Air Fryer Empanadas, Air Fryer Chicken Parmesan and Air Fryer Crispy Breaded Pork Chops. More recipes coming soon! 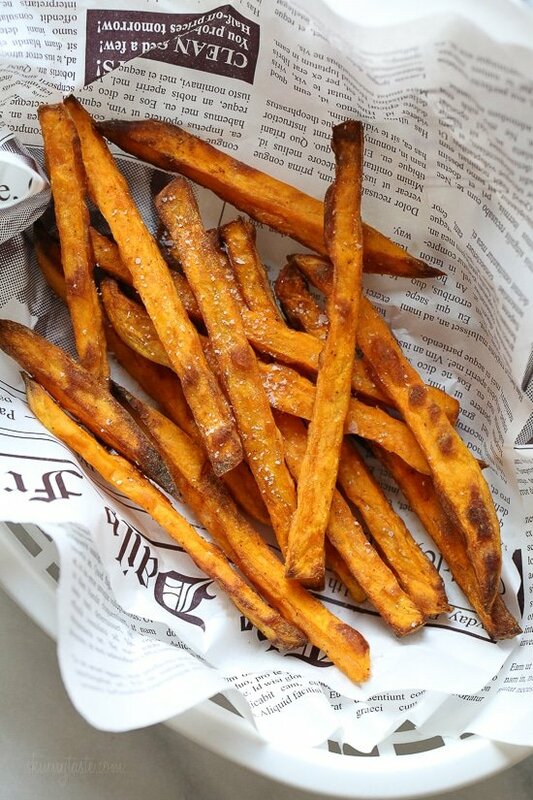 Crispy sweet potato fries made in the air-fryer, with just a small amount of oil! Making them in the air fryer is so much healthier than frying, and reduces the fat and calories, without sacrificing taste. Toss with oil, salt, garlic powder, black pepper and paprika. Cook in 2 or 3 batches, without overcrowding the pan 8 minutes, turning half way.